As well as reducing investment risk, an iterative approach allows governments and investors to move more quickly and tweak solutions as they are built. Cut through the hype around smart cities and it becomes plain that they are simply about making urban centres work better than they have before. Funding them can be simple too and government can help. But not necessarily with money. What’s needed most is a reform of procurement processes, regulation and data sharing. The most interesting innovation will come on the micro scale, with everyday innovators proving concepts, bootstrapping them into profitability and scaling them up on a national or even global scale - either with government help or seed funding from the private sector. But neither governments nor the private sector have solved the problem of how to work together to achieve these improvements. Both parties will need to overhaul their approach to create better ways to collaborate. To realise the potential, our procurement, data sharing and ﬁnancing models must change. In Australia, the Government recognises in a landmark paper on smart cities that that its role is to set the parameters for innovation and admits government is not the ideal party to create innovation, which must be led by the private sector. The Australian Government has also just opened up $US520 million in contracts to small IT firms and start-ups with a restructure of procurement processes. At first glance this looks like a small percentage of the government’s $US8 billion IT spend – but it is a huge amount for lean, hungry, nimble firms in this space. I anticipate that this move will have an outsized impact on innovation in this space. And while I welcome this move, the government must also share data more effectively and open up its “book” of challenges to entrepreneurial businesses with an appetite to solve them. Businesses and venture capitalists – like Azcende – recognise that local government problems tend not to be unique. Therefore, the solutions to them scale well nationally and even internationally. This is a powerful incentive for the private sector to work with a council on untendered work, in the hope that the solution they come up with can be resold at profit. Until these reforms are completed, the private sector will remain frustrated - it knows how to invest and that people want smarter cities, but faces obstacles in working with government and getting innovation through prohibitive government procurement practices. Right now, there is a huge appetite in the private sector to invest in solving the problems of cities. Right now, billions of dollars are being spent by the private sector in speculative technology; but where it requires city-level collaboration, that money will have to find its way through a narrow bureaucratic straw. If these investment approval processes can somehow be sped up, government will be able to take advantage of a huge pool of capital, innovation and growth that will transform our urban centres. In addition to this bottleneck, innovative technology is not being deployed because there is still a central planning mentality rather than an iterative start-up approach that could more eﬀectively deliver solutions. As well as reducing investment risk, an iterative approach allows governments and investors to move more quickly and tweak solutions as they are built. Ideally, the technology is proven on a small scale, then picked up in other areas. Take for example the energy space in the Australian context. In the short time that people have been installing solar power units on their homes and batteries to store energy, innovation is already happening – with the creation of smart virtual power grids, where energy suppliers can reach into household batteries and tap the storage of electric cars to meet demand at peak times. In March, Australia’s largest energy provider, AGL, went live with a virtual power grid, which utilises the storage batteries of 1000 Adelaide homes to draw up to 5mW of power during peak energy use periods – the equivalent of a small power station, without having to build a physical plant. While 5mW is not a huge amount of power – the biggest coal-ﬁred plant in New South Wales produces 200 times as much energy – it could point the way forward and can be described as a proof of concept. Large companies are already investing heavily in smart cities. 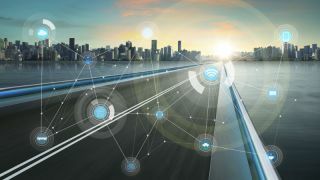 In the data space, a nationwide Internet of Things has been announced; Australia’s telco giant Telstra is already delivering successful solutions and reaping $150 million annually in IoT revenue. If smaller businesses and start-ups were also able to invest in building the cities of the future, a small nation like Australia could become a world leader in the field. Without the opportunity to demonstrate this innovation, nations risks lagging behind countries that are prepared to take that risk. While national and state governments can support initiatives as they scale, I believe that this small-scale innovation must be fostered at a local government level. As the level of government closest to the everyday needs of the constituency, local government is uniquely positioned to improve people’s lives in a way that will have an immediate impact. But local council will need to reform itself to work better with the private sector. Current hierarchies and procurement processes can slow or even stymie progress. The current council structure has been characterised as “one CEO, ﬁve departments and 2000 staﬀ using procurement processes that go back 40 to 50 years”. In my dealings with local council there is no lack of interest in innovation, but I often encounter an impenetrable wall of bureaucracy. With the technology we have available, we have the ability and the opportunity to build smart cities and improve people’s lives today. The sum of all these projects – large and small - will create our goal: an improved urban space where people can be their best as they live, work, trade and play in comfort and safety. It may be that one day Australia, with its geographic challenges, solves problems that will transform the developing world – if we do it will because we made the right choices today. Government has a key role to play in laying the foundations.